Unfortunately the boat is on the hard until next spring... But the batteries are in it. Please let me know what you guys think is causing my motor getting eaten! 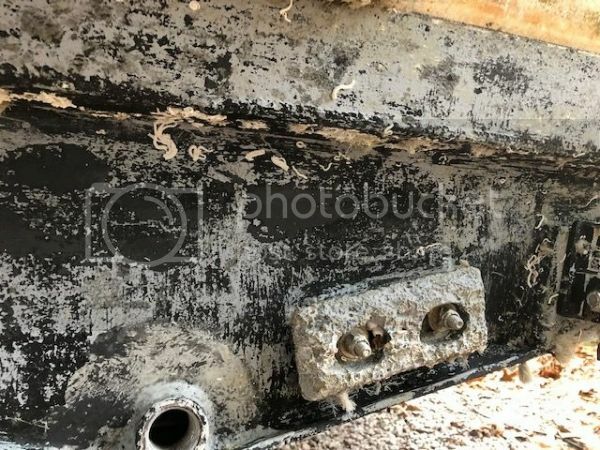 Pictures can be deceiving but it looks like your hull might have been painted with copper antifoul paint which, if that is the case, will be causing quick anode depletion on both hull and engine and corrosion on the engine since the castings on the motor are typically lower on the galvanic scale than the 5086 hull plating of the boat. Everything is tied together on an alloy boat so the copper paint (if that is what you have on there) is attacking (drawing electrons) from the easiest available sources, anodes and engine parts. If this is the case your hull needs to be sandblasted clean, epoxied and coated with non-copper bottom paint. Replace all anodes on the hull and engine including any that are internal with aluminum anodes (Navalloy or equiv). Replace that corroded plate on the engine. The problem could have also been caused simply by using the wrong anodes (zinc) or poorly attached anodes that don't adequately protect low nobility aluminum die castings (typically your o/b engine parts) thus allowing high nobility metals like your SS prop or even your marine grade aluminum hull plating to attack your engine. You mentioned that your engine anode was getting eaten up rapidly until you switched your hull anode to aluminum navalloy. One of the weak areas I've seen on Evinrude engines is the way they mount the main engine anode. It is a poor connection scheme so the engine anodes oftentimes don't work well when they are slightly used up even though they look OK. So that issue along with a zinc anode on the hull means the stainless prop can cause a lot of damage to inadequately protected engine parts. Default Re: Correct anodes for aluminum hull? Here in the PacNW everyone uses conventional zinc anodes on our hulls. I've heard that in fresh water there is a special zinc required but never needed to look into it. Skypoke, the usual set-up here - weld a couple of plates to the transom on edge, sticking out the back that are big enough to bolt a set of large rudder zincs to each one. If you plan on leaving the boat in the water for extended periods of time then weld them on high enough so you can bend over the aft platform and change them without getting anything wet but your arms. With the plates sticking out aft they are easy to scrub with a stainless brush when changing zincs and the zincs are easy to keep an eye on. 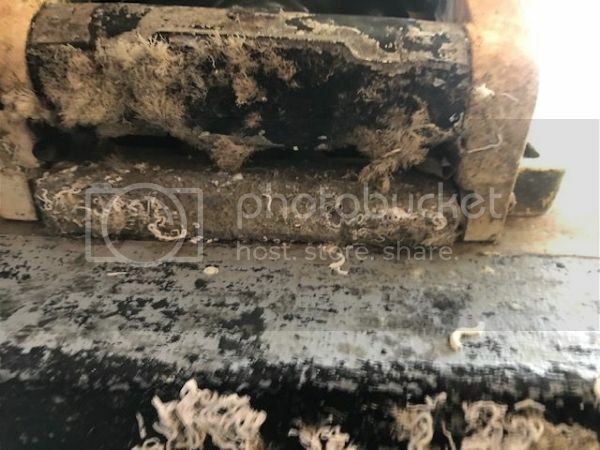 Thanks for the reply, what you are seeing in the hull photos is the epoxy barrier coat and ablative non-copper paint which was pressure washed. 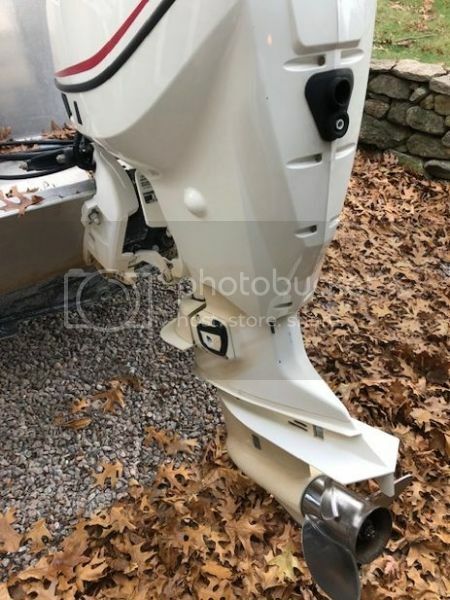 Interesting about the Evinrude motor anode issue, I will replace all the anodes this winter and make sure that they all have a good connection. Is there anyway that it might be a grounding issue? as always THANKS for the great information!! 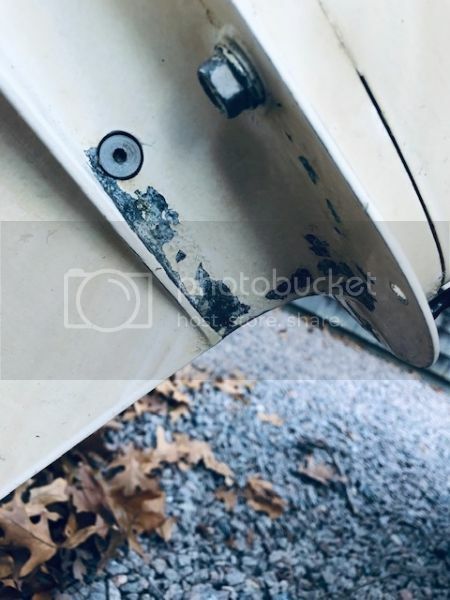 Since then I've run a bottom painting business and have seen the damage done by using zinc anodes on aluminum boats and outboard motors on plastic boats. another item that has come up in my recent inspection of a really new, name builders' very costly boat is the way the 'zincs' are mounted to the hull. Many believe- and I think they are in error(?) that bolting on anodes (regardless of alloy) with SS bolts is the "best practice?" I have to disagree based on what I've seen on some locally owned welded aluminum hulls. SS, even if the bolts are passivated and these did not appear to be, has a decent galvanic potential for both 'zinc' and aluminum! So it is not THE best choice for mounting: my reasoning? #1 there is some galvanic potential just between the SS and the hull and anode- regardless of the alloys. #2 Many of the installations I've seen are relying on the SS bolt as the conductor to the hull!!! In the photos above- I think I see some studs protruding from an anode? that implies the back of the anode/sacrificial plate is "common" to the hull's dedicated plate for mounting? This is better than some of the installations I've been seeing here. What I've seen features the entire anode standing OFF the hull! mounted on SS bolts! #3 if the only conductor to the hull is SS- then..... a much more noble (nickle alloy steel) is being relied upon to have a Zero Ohm connection between hull and anode??? EVEN when the joint/bond/interface/connection/conductor point of the two metals (aluminum to SS) will naturally react with one another and change the resistance to a very high value- totally negating the (least resistant) current path from hull to anode! If you sand the mounting plate down to fresh metal, and install a new (aluminum alloy) anode- you might want to consider using Hot Dip galvanized bolts instead of SS- the potential is much lower, and therefore the mounting system will not be nearly as reactive as SS bolts in the same location. I'm not sure of the metal alloy of the various bolts on the outboard leg shown? IF any are uncoated steel or SS, then it would be worth your effort to install new bolts. Galvanized threads are "bigger and deeper" to allow for the zinc coating.... so you'd have to re-tap the cast aluminum- not wise since you don't know the thread tolerances in the lower unit's casting. But one thing you can do is to clean and paint the heads of any steel fasteners and get some passivization gel and clean the SS fasteners to reduce their surface reactivity. Just some observations about the photos' information and my assumptions based on those pics. If the bottom coat is copper based (???) ! that has to go, as Chaps has said. But the mounting hardware could be contributing to the problems not reducing them? generally aluminum threads- of almost all types are unreliable. I'd say that only the most rare mechanical circumstances justify aluminum thread fasteners- my experience with them has shown them to be Fragile, at best. IF you torque an aluminum bolt- it will elongate and tear at a point in the threads' notches, at unacceptably low torque values. Female aluminum threads- that is tapped threads into aluminum of sufficient thickness are the least fragile threads, either bolt or pipe type threads, but even those seem to be very fragile and subject to corrosion, galling and aluminum to aluminum fusion. Weld-on anodes are about the best bet IMO. Tapping (with an appropriate sized tap) a welded-on block of aluminum and using hot dipped galvanized cap screws is about the only mechanical fastening that isn't going to shift resistance due to metal-to-metal galvanic interaction. But cast in aluminum strips (where the anode is poured around the aluminum weld strip/bar) welded to a sacrificial plate is likely to be the best low resistance (0 Ohm) joint you can use. funny that you think hot dipped with zinc coating- the former "only material" used in anodes! is not acceptable for aluminum work! Why could it be used as an anode for the last 70 years? Since the Galvanic differences are about as minimal as found between any two metals? no matter how you shake it, or view it - physics is physics and there's lower potential from hot dipped galvy-to-aluminum than most other full strength fasteners- especially SS, even when the nickel alloys are passivated. Been using whatever the skipper wants on my boats since the 1970's - ("the Skipper is Always Right" being the builders' adage). But my own stuff has been hot dipped for a long time, and there's no risk in low galvanic potential metals in near proximity to one another. Unless 70 years of using Zinc as an anode was further wrong than it's current understood? kevin, you seem like an experienced guy. have you ever seen a case of rust(iron oxide) seeping through failed galvanized plating? not all zinc plating is done well. i have no problem with zinc plating...it is what is under it i have a problem with. like you said, it comes down to what the skipper wants. yes, Krisinak, I have made more mistakes in welded aluminum boat building that the average guy since 1977 when I started building, and I have seen many fastener issues, so I "am experienced". But overall, I've seen SS gall to itself, calk up, twist off, elongate and lose torque.... and corrode the aluminum and act in a dozen different ways that were worse by far.... than the hot-dipped stuff does. I'm not sparing expense in buying hot dip- I'm paying close attention to the vendor (tonnes and tonnes of SS is only marginally SS! lots of 304 on the low end of nickel that's still highly magnetic!!!) the product spec and the applications should be more exact but they're not But then we all know about the aluminum fiasco years ago when 5086 - wasn't up to spec. So I'm pointing out that SS (and especially aluminum) fasteners are no better in overall historic performance than a hot dipped. So, while I agree there is some potential (no pun intended) for steel plated with zinc to be a problem if the coating fails..... that to me- is a minor issue over the MAJor, permanent, huge, constant, galvanic differential with nickel steels. Engine mount bolts are out in the open so they'll be seen if there's a bleed through of steel rusting, but SS won't. Interior mounts, of heavy items like tanks, inboards, gen sets, big pumps and even plastic tank beds- don't get seen often compared to an externally mounted engine/outboard "Motor". In those applications, I can understand where a builder has concerns- but if a boat with these systems implied by the list of heavy equipment mounts above - isn't inspected regularly (?) then it won't matter what material is used, any deterioration is being missed by a negligent skipper. Look at the incredible number of buyers who don't insist their boats are etched!! (?) good heavens, I've seen thousands of boats many years 'younger' than may few hundred boats that look many years worse for the wear!!! Mine are dull gray, uniformly clean and smooth and have no pitting. 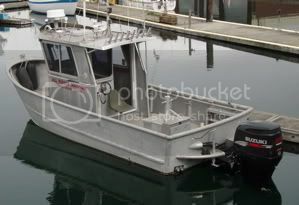 But I have been called to dozens of local boats, one to three years old from major Puget Sound builders which are flowering and have major galvanic corrosion from not only the failure to etch and remove mill scale- but from dozens of wetted SS screw, bolt and tapped locations within the build. I conclude from what I've seen. My old zinc dipped fasteners look homely but they're still hanging on from the '70's. What else could I conclude? How does the 115 perform on the 2025? I have a Honda 90 on my 1925, no t-top and I top out at 36mph. I have been thinking of upgrading to a new 115 or 150 Mercury Pro XS. could you expand on this a bit? I'm not getting the conditions that lead to the corrosion?? There were images of lifted paint and some corrosion of the leg's sides near bolts!!! that sure-nuff was and is corrosion?? but "catching salt" is not all that clear to me? I guess these covers need to be removed and the mounts flushed with fresh water and cleaned. I hope that I've explained it. Challenge, thanks for taking time to share the reply. I'd say everyone involved is getting this repeated scenario wrong- that's my take. First the problem is coming in one location- the center of a die cast "aluminum" cover to a set of bolts on the leg's pivot column brushing (engine mount but not on the transom) and Second the center of these covers are 'popping' out, and Third the reports from years ago according to the posts on the links you kindly provided, show this is a manufacturing defect. The cover is not made of marine grade aluminum. It is not salt building up anywhere!!! This cover is not (real) aluminum but some form of pot metal/aluminum alloy that is not marine grade, casting material. There is some galvanic source under that cover that is reacting with a bolt head/non-aluminum metal. That is happening while the boats are in the water an this portion of the leg is immersed- at rest. I'd say the factory coatings of this junk material cover are delaying the reaction over different time intervals. The covers, being substandard aluminum are (probably) being dip coated- may not even be powder coated to the spec of the engines' leg housing coatings? Don't know but .... I'll wager there is a casting riser that is near to dead center in this little cover? That is not being cleaned down to 100% flush, thus the 'nub' of the casting riser is a thin spot in the coating (which might only be paint?) and is where the galvanic cell to the head of a nearby bolt is reacting? All that is speculation, I'm only giving my opinion based on what you've shared. 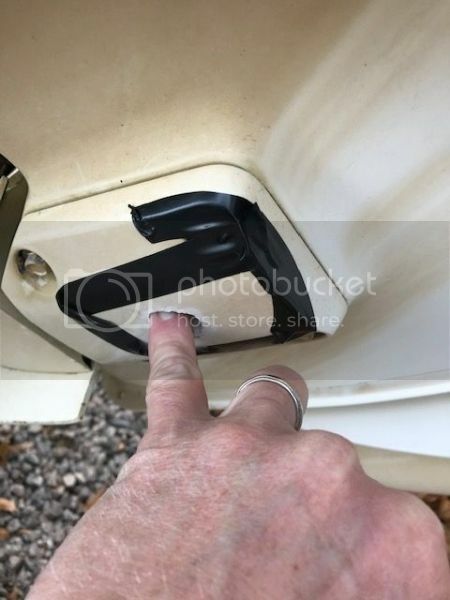 The dealer said that he sees it occasionally that salt & corrosion builds up behind this plate where the lower motor mounts are and a quarter sized piece of the cover pops out or it cracks. salt by itself has no effect on marine aluminum- but cast pot metal and a SS bolt head that is not passivated, close together in a submerged housing.... ? now that will create a repeatable corrosion site every time. Anyway, good luck with your re-power, and thanks for posting. I'm still of the opinion that the heads of the other SS bolts were reactive with the metal under the paint and lead to the factory paint lifting off the legs' surfaces near the bolt heads. "Been using whatever the skipper wants on my boats since the 1970's - ("the Skipper is Always Right" being the builders' adage). But my own stuff has been hot dipped for a long time, and there's no risk in low galvanic potential metals in near proximity to one another. Unless 70 years of using Zinc as an anode was further wrong than it's current understood?"